Scratching is a natural behavior for cats. Cats scratch to groom their claws, the scratching motion helps remove dead sheaths from their front claws (they usually chew them off their back claws). They scratch to mark their territory. Their front paws contain scent glands, and scratching leaves behind their unique signature on the object being scratched. They scratch for exercise; scratching stretches the muscles in the front legs and all along the back. And they scratch simply because it feels good. This post is appropriately named. 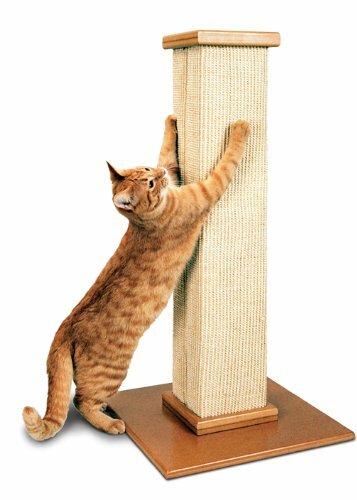 It’s tall enough to allow cats to scratch and full stretch, it’s sturdy enough so it doesn’t topple over, and the sisal is thick enough to be very durable. We have one of these in my office, and it gets daily use. Available from Amazon with free shipping for Prime members. 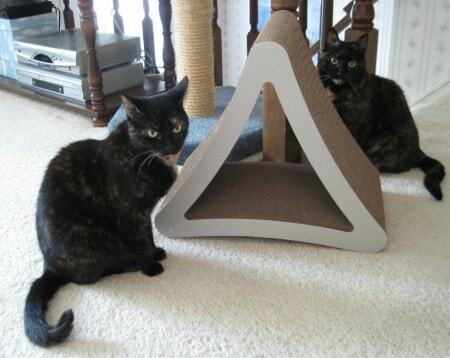 This good size, sturdy cardboard scratcher had a unique, patented three-sided design that lets cats scratch to their hearts’ content, but it also gives them an alternative place to nap. This scratcher is one of Allegra’ favorites. Available from Amazon with free shipping for Prime members. 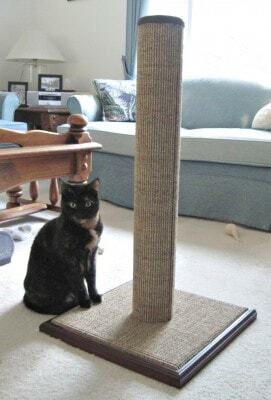 The unique sloped design of this scratcher is perfect for cats who like vertical scratchers – it adds a little extra interest to the traditional “straight up” vertical models. The scratcher is very sturdy on carpet, and it comes with a pack of silicone floor grippers to prevent movement on hard floors. Added bonus: at our house, this has also become a favorite cat toy. The girls love to stalk each other through the opening. Available from Amazon with free shipping for Prime members. Another one of our favorites, the Purrfect Post was developed by a veterinarian. Beautifully designed and extremely sturdy, this post is not one that you’re going to want to hide in a corner. 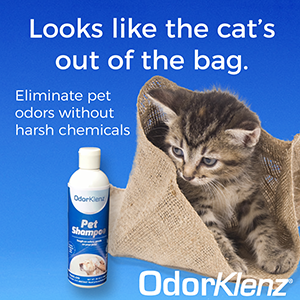 We have one in our living room, and both Allegra and Ruby use it daily. Available from PurrfectPost.com. This is a classic. It serves as both scratcher and lounge, and it’s reversible for twice the use. This one has been on Allegra and Ruby’s wishlist for quite some time, perhaps Santa will bring them one this year. Available from Amazon with free shipping for Prime members. 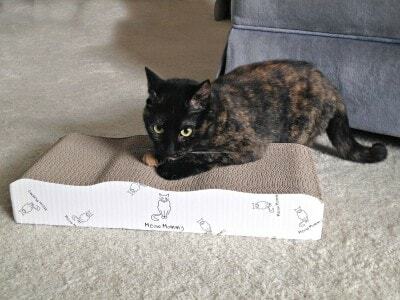 At 3 inches, this scratcher is nice and thick, and the cardboard is sturdy. One side has a wavy design, the other side is straight, which offers variety for cats who prefer different types of scratching surfaces. Available from Amazon with free shipping for Prime members. Disclosures: The Amazon links in this post are affiliate links. This means that if you purchase something by clicking through on one of these links, I will receive a small commission. where can I find the Sisal Fabric? I have a Large Aruba Cat tower, and would like to replace all of the Sisal Rope with the fabric. 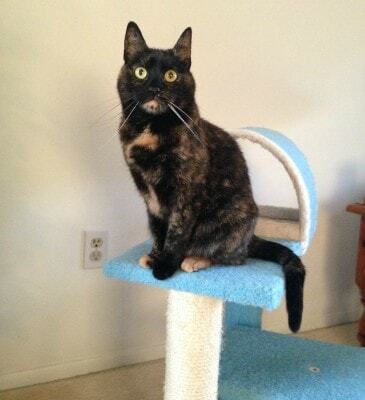 Our long-time favorite is the Purrfect Post! Would you believe we have one that’s 9 years old??? (we actually have three in all) They also offer replacement posts (without the base) for a very reasonable price. We’ve only had to replace one post in all this time. Isn’t it awesome? We’ve only had ours for a little over a year, but it gets daily use. I wish I’d gotten the one with the bed on top. I have 2 of the Ultimate Scratching Posts. They’re the best ever! They don’t take up much space and they look nice too. 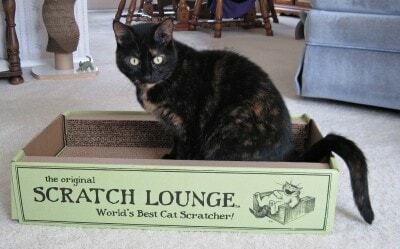 My cats love the ultimate cat scratcher products. I have a pass scratcher from them and after 4 years of almost constant use from 3 cats, it’s finally time to replace it. You really get your money’s worth. 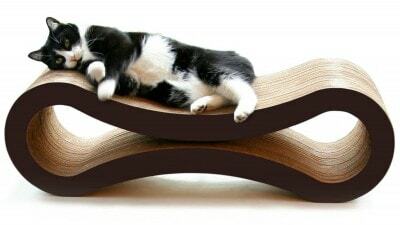 We have had the Pet Fusion Cat Scratcher Lounge for a couple of years – it is older than me! And every kitty here has loved it dearly! Even so, it still does not look bad!